Special congratulations goes to the follow three students who received Endeavour Awards in all five ceremonies over the last two years. And outstanding achievement! Subject Cups for 1st in subject, and acknowledgement of 2nd and 3rd places. Awards are also given to the top performing Maori and Pasifika Students. To find out more about the prizes we hand out here is a link to last year’s prize winners. This last section of today’s Dean’s Assembly is titled: That’s so gay. And what I want to do is explain clearly to you the difference between me saying “I am gay” and what the image here conveys. I have chosen to speak about this because I regularly hear the misuse of the word ‘gay’ on pretty much a daily basis. Today, I want to eliminate gay as a pejorative from our language in Year 10. Realistically, we are a safe school here and you might argue that because we have openly gay students and teachers, we have a support group for gay, lesbian, bisexual and transgender students, we are really tolerant of difference here – why does this matter? And it matter because I’m convinced all of you have heard, or maybe even used, in the past week the word gay to describe something that was neither homosexual… or happy. This is wrong. What it often comes down to is not hate or bigotry or homophobia – but laziness. Gay is not the word you mean but it has become such an easy word to thrown out there but it’s actually not what you are trying to say. Look at all these other options. If there’s one thing you take away from today let it be this: Say what you mean and mean what you say because the words that you say matter. When you misuse the word gay it hurts people. Statistically speaking, 20 of us in this room today are or one day will identify as gay, lesbian, bisexual or transgender. Misusing the word gay suggests that being gay is being less or inferior. This simply isn’t true. 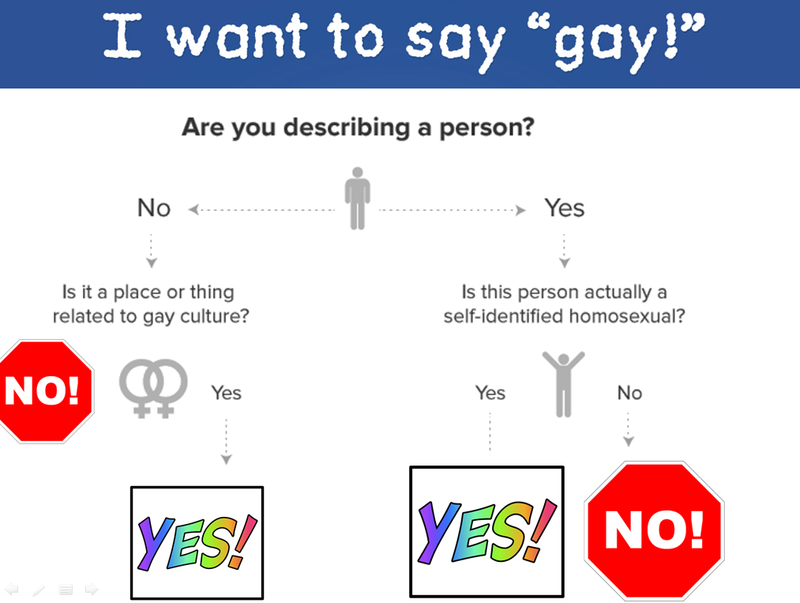 Being gay is not a bad thing so my message to you today is to use the flow chart, engage your thinking and make positive decisions about the language that you use. Furthermore, when you hear the misuse of language, what do you do? Do you silently accept it, or do you challenge it – say that the person made a hurtful choice with their language – and help them to find a more appropriate word? I’ll leave that to you. Whether it be using the word ‘gay’, posting something online, showing your commitment in class, striving to reach your potential with your learning or selecting a subject for next year. Make sure you a making good decisions. This entry was posted in Celebrating Success, Dean's Assembly and tagged awards, Decisions, Endeavour Awards, Gay, Junior Prizegiving, Language, Pejorative, Positive choices. Bookmark the permalink.